Tonight on Bravo The Real Housewives of Atlanta premieres with an all new Sunday, November 13, season 9 episode 2 called, “Housewife House Wars,” and we have your The Real Housewives of Atlanta recap below. On tonight’s RHOA season 9 episode 2, Mama Joyce lets rumors fly about Phaedra Park’s divorce; and an outing takes an unforeseen turn. Did you watch last season’s RHOA finale where Kandi and Todd focused on parenting baby Ace in the Season 9 premiere. Also: Kenya and Sheree made progress in completing their dream homes; the ladies raised questions about Porsha’s anger? If you missed it and want to get caught up before tonight’s episode we have a full and detailed The Real Housewives of Atlanta recap, right here. 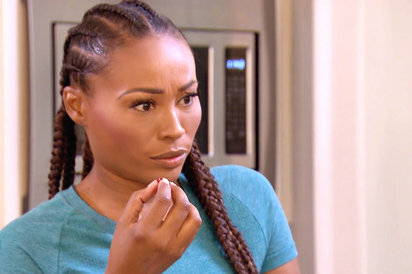 On this week’s episode of Real Housewives of Atlanta Kenya’s housewarming party continues and Kenya is not happy to see Porsha when she comes downstairs from giving the ladies a walk through. Cynthia asks her “Isn’t it nice?” Porsha says “It looks like it is coming together. It has walls and everything.” Kenya takes Porsha outside and tells her “I don’t want to make this an uncomfortable confrontation, but I didn’t extend an invitation to you because of some things that had happened in the past and I would appreciate it if you left.” Porsha handles it well and tells Kenya “Ok. That’s fine.” She and Phaedra head out together. Sheree decides to leave with them. As the three ladies are leaving they encounter Matt coming up the hill to the house. Everyone is concerned about how he will behave. Kenya asks him “Do you want to go talk?” Matt says “Yes, I would.” Cynthia says “I thought Kenya was trying to move on, but apparently not.” Matt and Kenya move off to talk. The next day Cynthia is talking to her daughter Noelle. She tells her “I spoke to a lawyer about a divorce.” Noelle tells her “You seem a lot happier since this whole thing started.” Cynthia says “You could tell I was unhappy?” Noelle tells her “It honestly made me question whether or not you had low self-esteem.” Cynthia is absolutely shocked to hear this. She realizes the impact staying in the marriage has had on her daughter. She hugs Noelle and apologizes to her. Kandi and Todd are working Ace’s product line. Kandi’s mom walks in and they commence to talking about the plans for the restaurant. Kandi is not happy because the contractor is dragging their feet on the construction. They move on to talk about the housewarming party. Joyce asks them “How was the housewarming?” Kandi tells her “Kenya put Porsha out of her house.” Todd says “You can’t invite someone to your house and put them out.” Kandi tells him “Kenya did not invite Porsha. She was Phaedra’s plus one.” Joyce goes off and says “They need to understand the depths Phaedra will sink to. She needs to be sharing a cell with her husband!” Everyone laughs. Phaedra tells her “Kenya is having an event and she wants to invite all of the ladies, even you. Will you come?” Kenya is skeptical about attending this event. She says “Let me get back to you when I get the invitation.” Sheree and Porsha are talking about the same event. Porsha tells her “I am inviting everyone, including Kenya.” Sheree seems shocked by this. Porsha tells her “I didn’t invite her just to kick her out!” Both women laugh. Sheree and Porsha are talking about the same event. Porsha tells her “I am inviting everyone, including Kenya.” Sheree seems shocked by this. Porsha tells her “I didn’t invite her just to kick her out!” Both women laugh. Cynthia meets up with Peter. She tells him “You need to call the lawyer because he needs to talk to you.” Peter tells her “I know. It is just not a high priority for me right now.” He tells her “I went to the hospital the other day and they asked me who to call in case of an emergency. It hit me that it can’t be you anymore.” Cynthia tells him “That’s not true. I still care about you even though we are getting a divorce.” Peter is very emotional as he pulls out his phone and calls Cynthia’s lawyer. He tells him “Send me whatever you need to send me and I’ll sign off on it.” Cynthia thanks him and tells him “You look good. Have you been working out?” Peter laughs. The two teams get to work on the mysteries in their respective rooms. Neither team is able to solve their mystery room. After the event is over Kenya approaches Sheree and says “We are going to start a new project called building Chateau Sheree and Moore Manor.” Sheree seems to like the idea. She tells Kenya “We should’ve done this a long time ago.” Kenya tells her “I had contractors to deal with.” Sheree tells her “I don’t really need much help though.” Kenya laughs. “I don’t want trim.” The argument intensifies until Kenya decides to leave.